Offering you a complete choice of products which include personal locker unit, mobile compactors storage system and industrial locker cabinets. Personal Lockers offers a space saving & safe storage of personal belongings of staff/ members at colleges, research institutes and clubs. We offer vide range in Personal Locker Cabinets ranging from 01 Nos individual lockers to 18 Nos individual locker units in single cabinet. These lockers are manufactured from Mild Steel or prime quality CRCA & are powder coated to protect them from rusting. All locker unit doors have ventilating louvers for air circulation. We offer additional accessories like label holders, stands, hanging rods in Cabinets with 1 or 2 doors. Lockers can be provided with or without locks & can function as stand-alone units or as multi - unit configuration. Backed by years of industry experience, we are engaged in offering a premium quality range of Mobile Compactors Storage System. Industrial Lockers Cabinets offers a space saving & safe storage of personal belongings of employees at factories, laboratories & R&D Centers. We offer vide range in Industrial Locker Cabinets ranging from 01 Nos individual lockers to 18 Nos individual locker units in single cabinet. 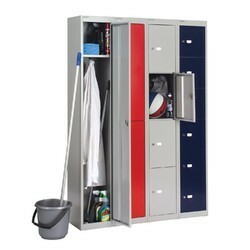 These lockers are manufactured from Mild Steel or prime quality CRCA & are powder coated to protect them from rusting. All locker unit doors have ventilating louvers for air circulation. We offer additional accessories like label holders, stands, hanging rods in Cabinets with 1 or 2 doors. 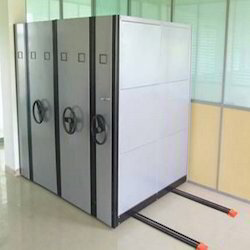 Lockers can be provided with or without locks & can function as stand-alone units or as multi - unit configuration. Looking for Storage System ?